Copies of our newest Tool Kit and Guidebook were delivered to all publicly funded school boards during the fall of 2014. Extra copies may be downloaded and printed without infringement on copyright. The tips and suggestions throughout this package have been provided by parents from across the province, as well as educators, students, and experts in children's development including Mary Gordon, Dr. Bruce Ferguson, Dr. Jean Clinton, Dr. Debra Pepler and Children's Mental Health Ontario. These booklets were produced with support from the Parent Engagement Office at the Ministry of Education. The accompanying Guidebook is intended to help in developing parent workshops on important topics as outlined in the Tool Kit. We hope that Parent Involvement Committees (PICs), School Councils and other parent groups will find this helpful when working with school leaders in encouraging their students to succeed, and in building positive school climates. Please see the MORE INFORMATION FOR PARENTS section for a look at how three parent groups used the Guidebook to host informative workshops. The Tool Kit and Guidebook were intended as resources to help you as parents and guardians, as you guide and encourage your children in learning skills that are essential for success at school and throughout life. How can parents find the answers to the many daily challenges of parenting? Over many months, parent representatives shared their concerns about the complex issues facing today's young people. Parents, students and educators across Ontario have worked together to create this resource. The Tool Kit is a collection of ideas, tips and resources for you to support your children. It is intended to build upon the many good things parents are already doing. In addition to the creative suggestions given by parents, we are grateful to have been supported by professionals with expertise in areas such as children's mental health, conflict resolution, development of empathy, building of resilience and prevention of bullying. We hope that you will find these resources useful. We thank the many parents, PICS, experts and educators that have contributed to this project. Several Parent Councils and PIC groups have organized events based on the Building Healthy Relationships package. Here are their success stories! This was a parent-focused open conversation led by the Near North District School Board Mental Health Lead. The presentation had been tailored to address input offered by students, Principals, SAC Chairs, and PIC Co-chairs. The presentation was an interactive conversation offered both in person and online as a webinar. We had 40 parents attend face-to-face, and ten parents attend via webinar. This format helped to address the diverse needs of families throughout our large geographic district. The parents that attended in person enjoyed a meal prepared by our high school culinary students as a way to highlight their talents. Child care was provided. For parents who could not attend in person, the workshop was available by webinar from home. The presenter's voice could be heard, and the PowerPoint presentation was visible. An IT person was on hand for the evening to assist in case of issues. Note, unfortunately the presentation was only available to homes with high speed internet connection. Due to the success of the presentation, the PIC is looking at bringing other topics of interest to parents in a similar format. Ice Breaker — What do you think about when you hear "Building Healthy Relationships"? Navigating the Tool Kit (10 minutes). Each group reads one section. Share an idea that resonated with you and share one or two of the ideas with group (20 minutes). Leaders can expand ideas by adding research information. a. What one thing did you learn? b. What one thing will you change or do differently? c.	How can you share this information with more parents? Twenty parents with children from grades k-12 attended the workshop. Four groups of five parents were formed; these are the highlights after reading sections of the Parent Tool Kit. In order to best accommodate the parents in our sprawling board, we held our event at two separate locations on the same night. We invited members of PIC, School Councils, and other interested parents to come out, and had a robust attendance at both of our locations. Hosting the two locations and saving many from a long drive was much appreciated by our parents. Many schools and parent council groups are bogged down in fundraising efforts and needs, so this session was mainly a brainstorm. Attendees shared ideas, successes, challenges, and resources around fundraising. The discussion often veered into related territory including the socio-economic make up of schools, equity, fair practices and the need to come up with a fair way for schools to share dollars. How do we get parents out to events? How do we keep parents informed of what's happening in the school community? How do we keep students engaged with their own studies and community? The animated discussions among groups at this table often included venting about frustrations in trying to keep parents informed, in working with administration, how to use Social Media effectively and the roles parent council groups take in engagement. There is no such thing as over-communication. Use social media whenever possible to "go where the people are." This is where the heavy issues came out. Everything from mental health, bullying, cyber-responsibility, resilience, and strategies for parents was discussed, along with some ideas for resolution, improvement, and how bodies like PIC can help. Parents and students alike are frustrated by "singular" focus in schools (e.g. numeracy, technology) and would like to see a more well-rounded curriculum. 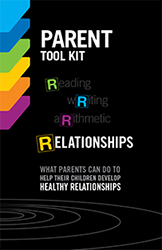 PARENTS NEED ACCESS TO THINGS LIKE THE RELATIONSHIP BUILDING TOOL KIT! Your Board has sent copies of the Tool Kit and Guidebook to all schools. Each school should distribute copies as they deem most effective. Some schools will give packages to School Council or other parent groups; others may choose to have additional copies printed for distribution. Additional copies of The Tool Kit may be printed and distributed freely without infringement of copyright. Make resource available at open houses, parent-teacher interviews, etc. Your Board has sent copies of the Tool Kit and Guidebook to all schools. Each school should distribute copies as they deem most effective. Some schools will give packages to School Council or other parent groups; others may choose to have additional copies printed for distribution. Additional copies of the Tool Kit and/or Guidebook may be printed and distributed freely without infringement of copyright. Research shows that healthy relationships among students, parents and staff help to create optimal learning conditions for everyone. School communities in Ontario have been working hard to create positive school climates where all learners feel safe and welcomed. There has been a focus in School Improvement Plans on building safe and accepting schools. We hope that the Parent Tool Kit will be a useful resource to support your school community's goals. A Guidebook For Parents and Schools provides activity ideas for Parent Involvement Committees, School Councils and parent groups. Please see the MORE INFORMATION FOR PARENTS section for workshop ideas and success stories. "I attended the seminar on this resource at the PIC symposium and was impressed with what I saw. I certainly hope they are being used in our schools!" "I love the Parent Toolkits! Our Trustee showed the toolkits at our last meeting. I would love to figure out a way that we could have the Toolkits presented at one of our Parent seminars. Hopefully we can discuss that for the future." "Encourage parent support groups for high schools. Many parents have difficult issues but have nowhere to turn. Sometimes just knowing that others are facing the same issues helps!" I'm really impressed with the tool kit which is why I was rereading the information at the start of another school year!" "I was just reading the healthy relationships booklet on the weekend. Does your group have the ability to support workshops? Is it possible to develop a webinar for parents to access?" "It's so hard to know that my child is hurting and I don't know how to help. It's only when I hear other parents expressing that same feeling that I realize I am not alone. I guess sharing our concerns is the first step in finding ways to help our children…"
"I am eager to increase parent partnership with the school and hope to promote some of the suggestions for 'parent engagement' in the Guide … However, in the section on anti-bullying, you assume that the unhealthy relationships causing pain for our children are always due to peer bullying. In my experience, much of the grief for students is because of treatment by the adults at the school. " "I liked the resources at the symposium – how does one get the energy back to the school?" "We had Dr. Wayne Hammond present to us on resilience. He offered us common sense – no need to look for experts – get back to be present with your kids … Accepting our children and ourselves is so important." Debra Pepler, Wendy Craig and Dilys Haner - "Healthy Development Depends on Healthy Relationships." John Hoffman - "What Is Self-Regulation"